In terms of restaurants, the stretch of Sukhumvit between Thonglor and On Nut has been food mecca in Bangkok. Hidden away from Thonglor’s main Soi is Nuvola—a dainty house decked out in pops of orange and navy—serving Italian classics with a twist. Arrive early and sample one of their special brunch dishes like uovo benedetti alla bottarga (B320)—egg benedicts whose gooeyness sings in harmony with mouthful savory and a hint of sweetness from the topped cured mullet roes. Alternatively, a true aficionado of Spanish cuisine can head to El Tapeo—a vibrant yellow tapas restaurant whipping out the vitality of good produce in the dishes like tosta (an open sandwich) and different types of paellas. For a fiery taste of Southern Thai food, hit up Khua Kling + Pak Sod, which highlight dishes like pork and beef iterations of kua kling, the minced meat palate-rouser served with a basket of greens from which the restaurant takes its name. Aside from parks to burn some steam (more on that below) Sukhumvit has a boat-load of venues to make family time a little easier. Flight Experience Bangkok (Gateway Ekkamai, 02-048-9922) is perfect for kids (let’s be honest, adults too) who dream of being pilots or just want to try their hand at pulling a Skully-style landing without having a heart attack. The experience is so realistic that film crews regularly use their simulator for flight scenes, but they offer more approachable classes (B4,550 to B11,000) for all ages. There’s also all kinds of family-friendly things beyond Thonglor, like Funarium (111/1 Sukhumvit 26, 02 665 6555) and laser tag arenas like Lazgam (Holiday Inn Sukhumvit 22, 02 663 7703) for some more exercise-related fun. The easiest way to help dodge global doomsday (in terms of effort and moral conscience) is to buy organic, green and local. Sukhumvit’s filled with a plethora of organic shops, such as Patom Cafe (Sukhumvit Soi 49/6, 02-084-8649)—which stocks soap, shampoo and massage oil, and fresh fruit and vegetables wrapped in banana leaf packages—both cute and zero-waste. This neighborhood is also home to two of the best farmer markets in all of Bangkok: Thailand's Farmer Market hosted by K Village every second Sunday of the month and the Bangkok Farmers's Market hosted at various places around Ekkamai every two weeks on Saturday—you can check out the event’s schedule here. With those tiny dust particles floating above Bangkok, clean air can feel like a luxury. 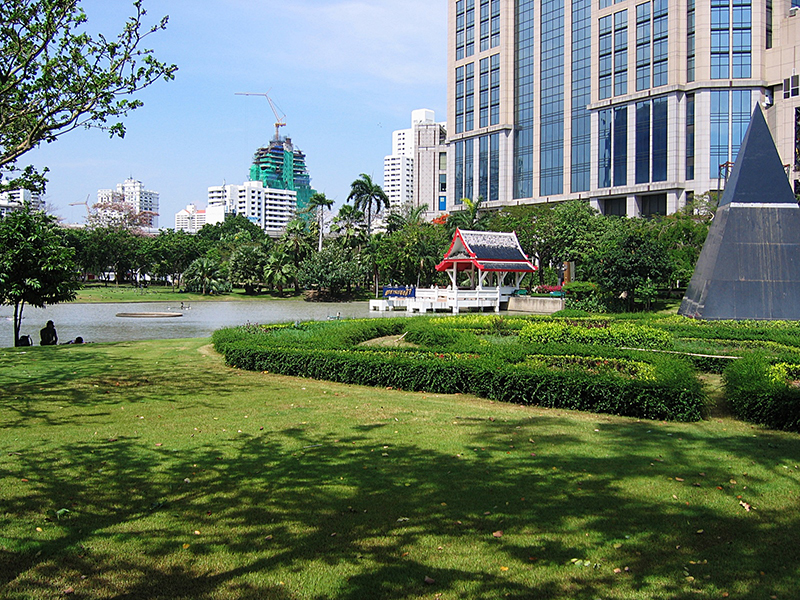 In spite of actually heading out of town, Bangkok has some great parks and green spaces to get a dose of nature when you need it. In Sukhumvit, Benchasiri Park, located between Soi 22 and 24, is your go-to spot. It’s packed full of lush greenery and great fitness facilities—including a basketball court, skating rink and swimming pool. Morning person? Hop there early to enjoy the peaceful atmosphere while jogging, or take your children to feed the fish and turtles living around the park’s small interior lake. Good schools are not hard to come by in Bangkok, but a good international school bundled with a great neighborhood and expat environment makes it more special. Sukhumvit is arguably one of the only neighborhoods in town that combines all three. Bangkok Prep has campuses near both Thong Lo and On Nut BTS stations (location, check; peaceful neighborhood, check). It also matches the international environment and lifestyle that expat parents are looking for—world-class facilities and an international learning community in proximity to where they live. It is also the only international school in the Sukhumvit Central Business District to offer a British curriculum for ages 3-18. Students can already benefit from state-of-the-art-facilities ranging from high-quality learning spaces to an Olympic sized swimming pool, Black box theatre, a rock climbing wall and much more. Sports enthusiasts will also get a kick out of the school’s wide range of teams such as football, swimming, rugby, tennis, gymnastics, rock climbing, cricket, golf and sailing. You can find out more about the school and register for a school tour here.